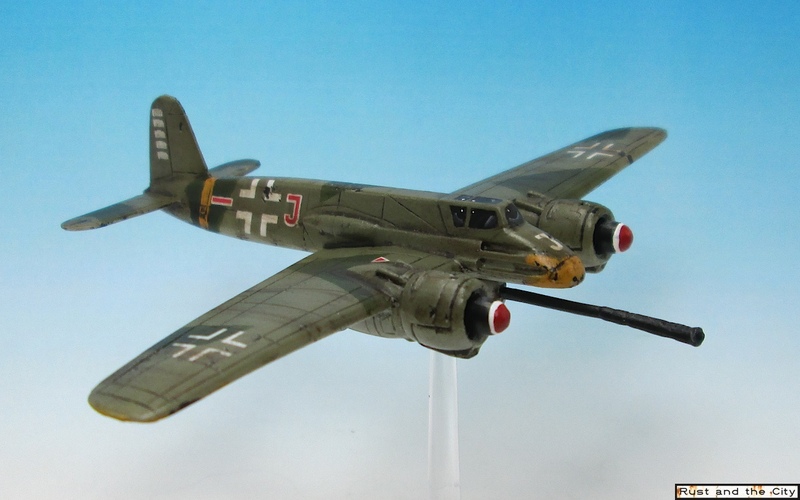 In this post I will share some pictures of an Me262 I painted as part of a commission. The model was painted with soft edged camouflage and a blue canopy. 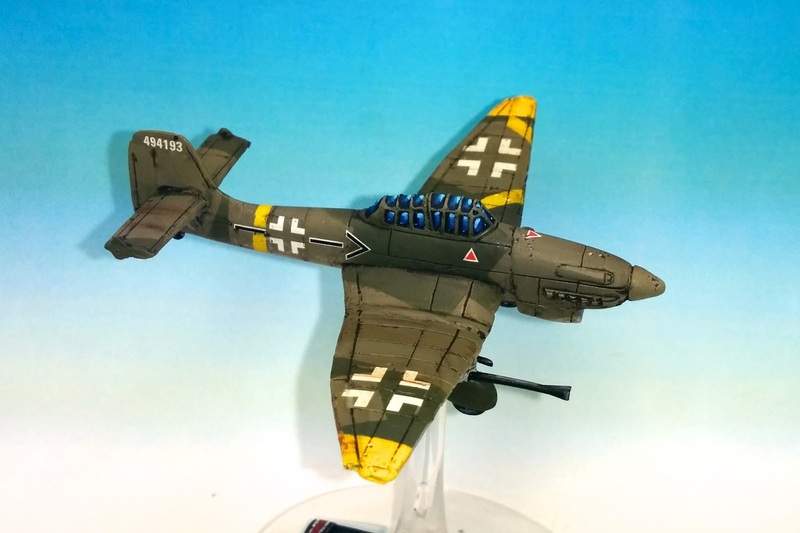 This model is a hard resin airplane model from Battlefront Miniatures. 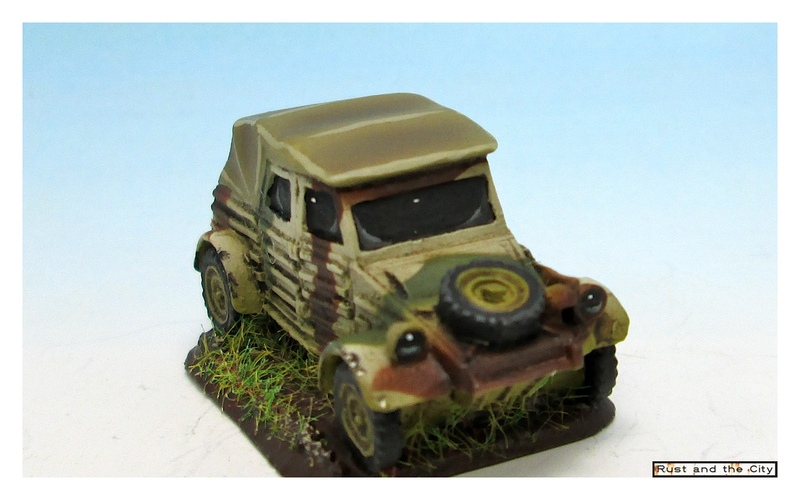 A few months ago a friend asked me how I would paint colour modulation on some desert vehicles for the new Fate of a Nation expansion for Flames of War. I decided to do a quick test on an old Panther hull. This tutorial will show you step by step how I achieved a modulated colour effect for this desert colour. For this tutorial I have used Vallejo Model Air colours. I recently finished painting Oberst Rudel for a Flames of War commission. The model is the Flames of War hero Rudel in a Stuka. I painted the model to roughly match the example on the Battlefront website. Rudel is a flying ace in Flames of War who is reputedly quite deadly on the tabletop. A few months back I posted about my challenge to complete my Panzer Lehr company for Attack-X in September. I finished that painting challenge 8 hours or so before I had to leave for the tournament. 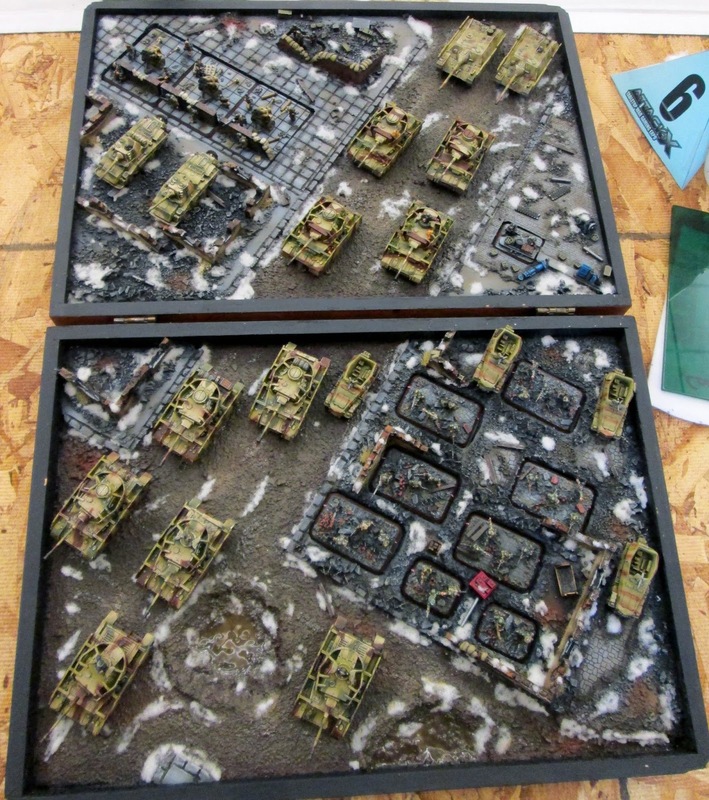 I am now planning a Panzergrenadier company to complete for Gottacon in Victoria February 27-29, 2015. I have three months before the tournament to finish 25 models and a display board. This weekend I found a few spare minutes to finish some hedge rows for my Flames of War scenery. The hedges are made out of scrub pads, PVC foam board, sand, paint, and flock. They were easy to make and feel very durable so far. I used the excellent hedge making tutorial over at The Demo Gamers to build the hedges. Be sure to check out their blog for some great tutorials and ideas for demonstration games. This platoon is another one of those platoons that seemed to drag on forever. I spent a lot of time in March preparing the models and getting the airbrushing and details finished. Then I used them in a game. All progress stalled there. It took me another six months to "unbog" and add the line highlights, chipping and oil streaking and grime. 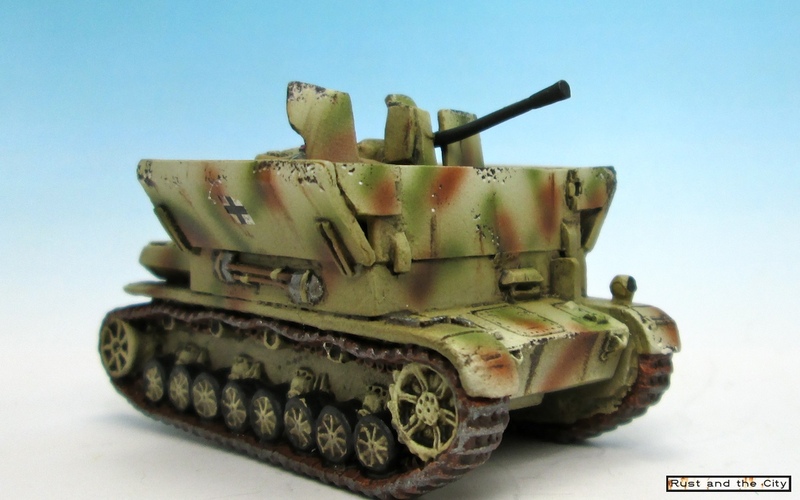 One day I will master the skill of starting one project and finishing it before starting another... Read on for more pictures of the completed panzers. 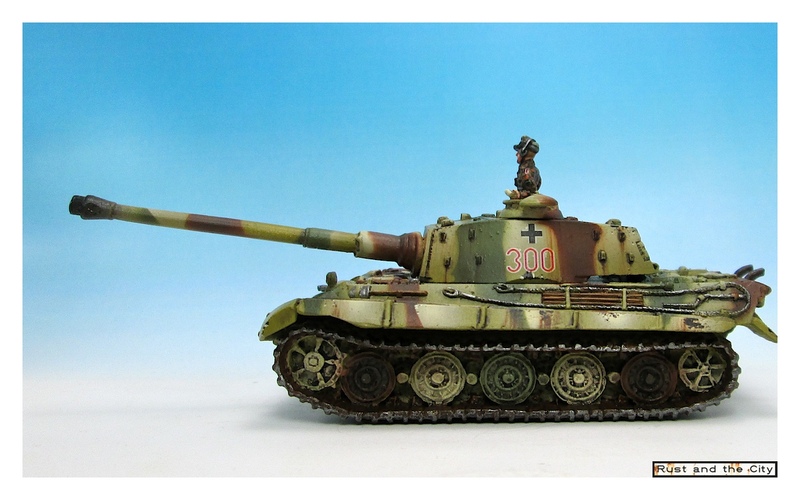 The models are 15mm Panzer IVs from Plastic Soldier Company. Last weekend I attended the Flames of War tournament at Attack-X. Attack-X is a small gaming convention in Kamloops, BC and ran from September 12th to 14th, 2014. The Flames of War tournament was a 1650 point late war tournament. I played a Panzer Lehr list from Panzers to the Meuse. In this blog post I'll share a recap and some pictures of each game . I've almost finished my painting challenge of completing my Panzer to the Meuse list for Attack-X tomorrow. I just thought I'd put a quick post up with some pictures of the completed Pumas. I'll show some pictures of the models in this post and discuss their role in my list. 15mm infantry are a lot of work to paint. Originally, I had aimed to paint this platoon quickly as a "speed painted" platoon to just have some infantry to put on the table. This speed platoon ended up taking me about 4 months to finish and countless hours to paint all of the details. German infantry suffers from having a huge amount of webbing and gear on them that takes a long time to finish. The infantry models are Battlefront Open Fire Grenadiers. The Sd.Kfz 250 half-tracks are from an unknown manufacturer. Chris' Miniature Woes recently started a six month challenge to reduce your stash of unpainted miniatures. I have joined the challenge and over the next six months I will try to reduce my own collection of unpainted models. My focus will be on drastically reducing the Flames of War models that have built in to a bit of a backlog over the last two years. Read on for some pictures of my lead mountain, a painting chart of the models I have to paint, and the rules for the challenge. I haven't actually played the Panzer Commander PC game. In this blog post I will show some pictures of my Panzer IV Company Commander and Second in Command for my Panzer Lehr Panzer Division. The tanks themselves are 15mm Plastic Soldier Company Panzer IVs. The tank commanders are plastic Battlefront models. 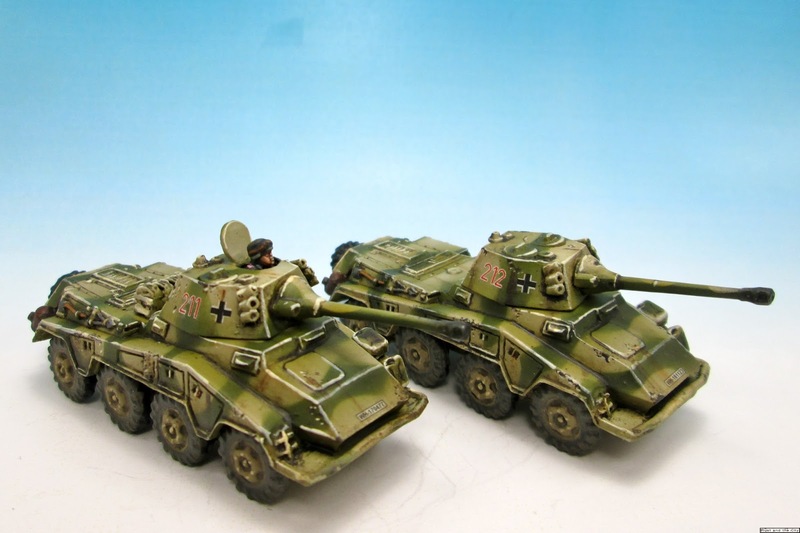 I painted these models in hard edge camouflage to match my other Panzer IVs. With these models complete, I am one big step closer to completing my Panzer Lehr list for Attack-X in a week and a half. Over the last year I have been slowly building a German Panzer company for Flames of War. In two weeks I will be attending Attack-X; a convention in Kamloops, BC with a five game Flames of War tournament. For a while my goal has been to field a German panzer company for this tournament. Unfortunately, I have not done much painting over the summer so I am frantically painting everything at the last moment! In this post I'll show you my list, my progress, and explain a little how I hope the list to play. I first started playing Warhammer Fantasy in 1997. It was the magical age of "Herohammer" and goblin green bases. I first became interested in wargaming when a friend at school convinced me to start playing so he would have someone to play against. I started the painting aspect of the hobby when I received the wonderful 5th edition fantasy starter set for Christmas that year. In this blog post I will show you one of the first models I painted alongside a more recently painted Bretonnian archer from the same set. Today I will show you how to quickly and cheaply make fields for your tables. This method can be used for any scale of game. In this case, I built my fields for 15mm games but I think they would look just fine in 28mm scale games too. This project allows you to cheaply build lots of fields for your tables. I built 12 or so fields for about $4 worth of supplies. After becoming interest in the X-Wing miniatures game I decided to try making a cheap and quick gaming mat to play on. This gaming mat cost me $8 in supplies and took me 40 minutes to make. In this tutorial I will show you step by step pictures for making your own mat. I used an airbrush for this tutorial but you could probably do a similar mat using spray cans. This mat does not look quite as polished as the professionally printed vinyl mats but is a cheap alternative for home games or if you are making many mats for a tournament or store event. Read on for some pictures of the finished mat and a step-by-step tutorial on how to make your own. I recently finished a set of rivers for my Flames of War table. I made the rivers out of 1/8” medium density fibreboard, glue, sand, rocks, and a bit of balsa wood. 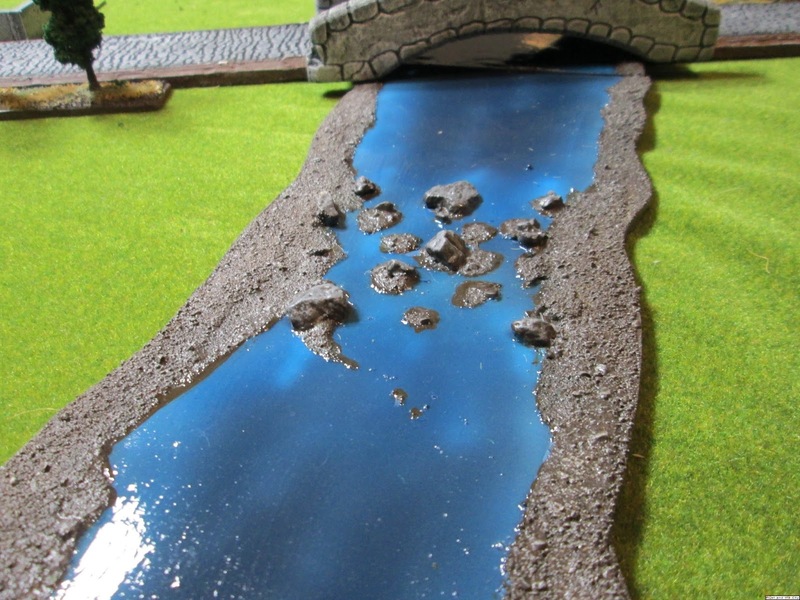 The rivers will add some variety to my Flames of War tables. 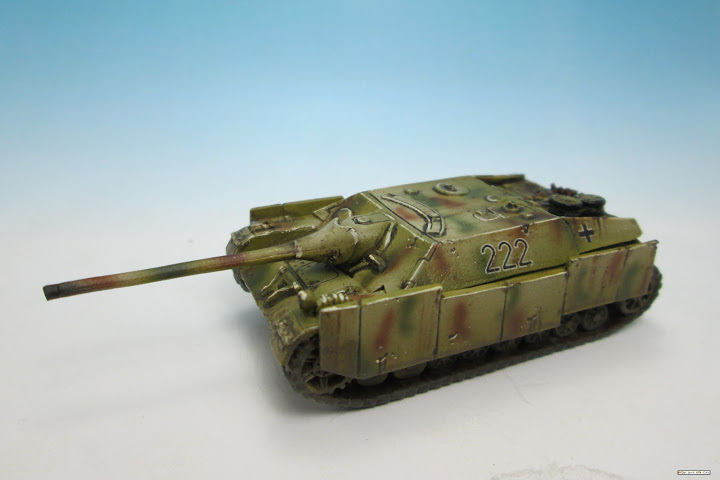 I painted two Panzer IV/70 (V) models for my Panzer Lehr Panzers to the Meuse list. The Panzer IV/70 (V) is a pretty cool looking tank and was quick and fun to paint. Not having a turret really speeds up the painting! These models were a bit of a pain to assemble but the final models came out looking pretty good. Read on for more thoughts on the models and how I plan to use them in games. This blog post will review the new plastic Panzergrenadier box set by Battlefront for Flames of War (GBX76). The box set contains enough infantry for seven stands of Panzergrenadiers, four Sd.Kfz 251/1D half-tracks, four crew sprues, and a set of decals. Each component is rated out of five. Models were painted using an airbrush, acrylic and oil paints, and colour modulation. After a bit of a hiatus, I have a new model to share. I painted this Zvezda KV-1 as a tank captured and used in the German service. I painted it as if it had been completely repainted in the field in German colours. The model was really easy to assemble and looks good when it is finished. In this post I will share a few pictures of the model and do a brief review of the kit. I painted a Hs129 for one of the guys I regularly play against. For this model, he also wanted me to magnetize the two gun options to make them interchangeable. After delivery, he used it against me in a game and it was extremely effective. In this post I'll share some pictures, explain how I magnetized it, and discuss it's uses in Flames of War. This blog post will review the KR Multicase Kaiser 1 bag and discuss the appropriate tray sizes for different Flames of War models. KR Multicase doesn’t currently have custom cut foam for Flames of War models but the standard tray sizes fit most models I have found so far with a little improvisation. 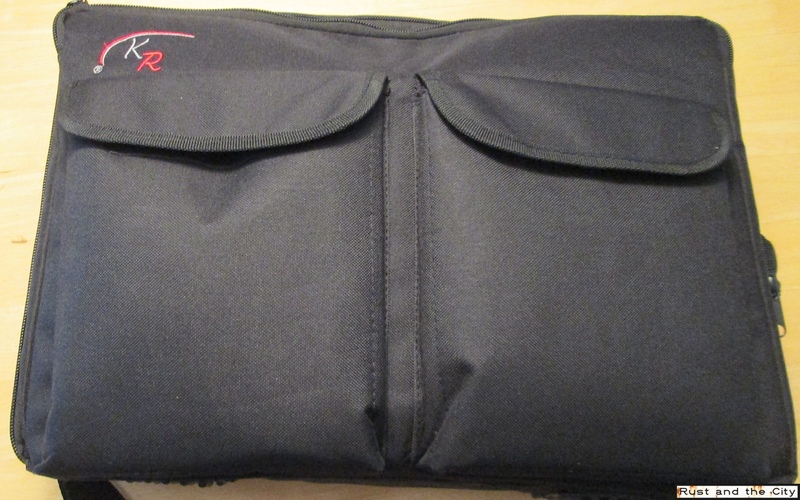 The KR Multicase Kaiser bag is a robust bag with space for your gaming supplies. 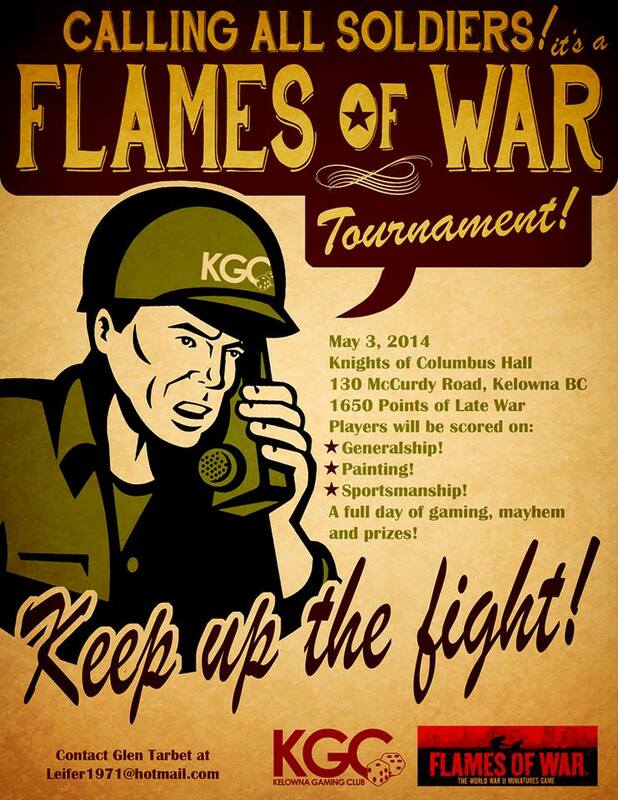 On Saturday, May 3, 2014 there was a Late War Flames of War tournament in Kelowna, BC. Glen (Leifer on the forums) hosted the tournament. In total there were 24 players from all over Western Canada who made the trip. The tournament was three Late War games of 1650 points. For this tournament, I ran the same army list as at Gottacon (11th Armoured Division Sherman company from Market Garden with US paratroopers, turretless Stuarts, Heavy Mortars, and Universal Carriers). Like the Heavy mortars and Firefly, I painted this platoon quickly for Gottacon in March. 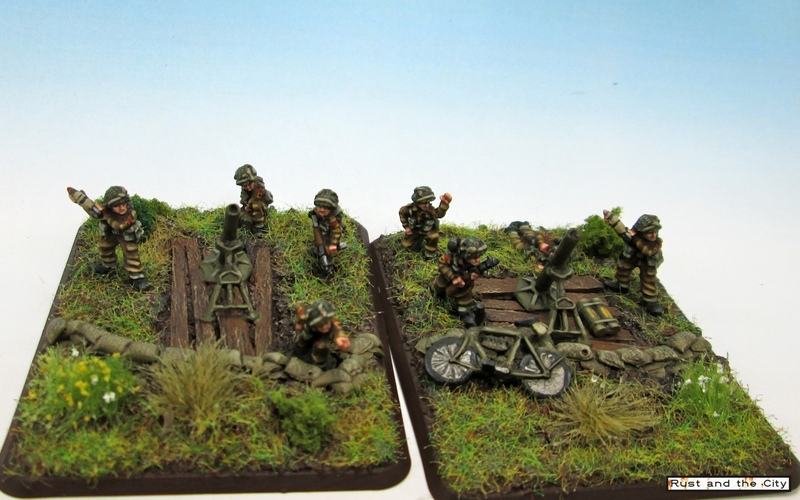 A player in my gaming group was wanting an anti-aircraft platoon for his list so I quickly painted up the Mobelwagen platoon I had been meaning to paint. I experimented with some the AK Interactive dunkelgelb set for this platoon. Over the last few months I have had lots of people comment on the models I have posted in winter white wash camouflage. My method for painting it is not unique but I thought I would post it here in a step-by-step tutorial. The technique I have used if often referred to as the “hairspray method”. The only change I have made is how I use the airbrush to add a bit of panel highlighting to the hairspray method. In addition to the Desperate King Tiger I posted last week, I also painted a King Tiger in winter camouflage for the same commission. 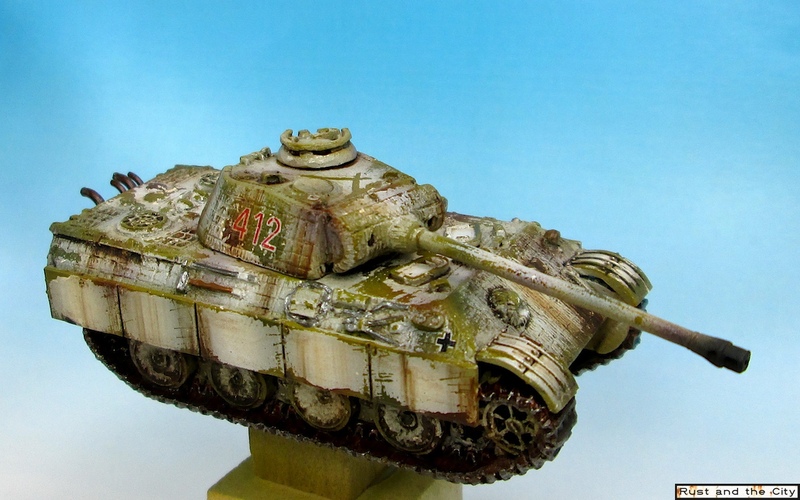 The client requested that this King Tiger be in Ambush camouflage with winter whitewash camouflage over top. It was a lot of fun to paint the ambush camouflage and I was quite interested to see how it looked with the winter whitewash over top. I was concerned it would look too busy but I think the end result turned out nicely. 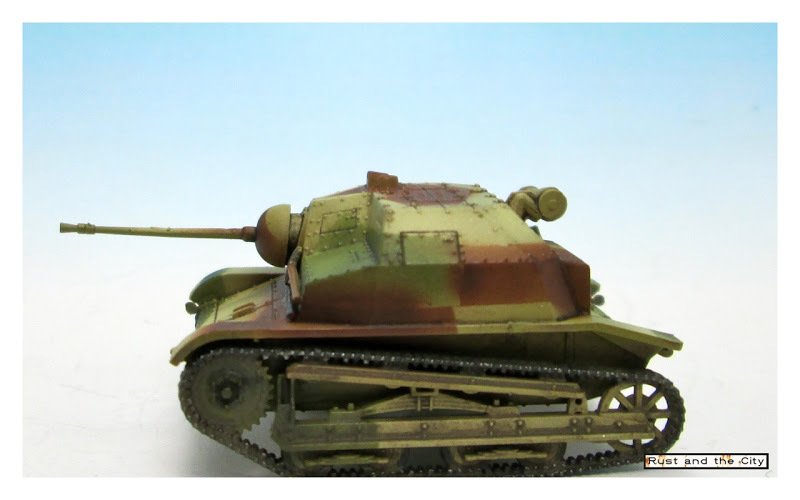 In this post I will review the new Polish TKS Tankette in 1/72 scale by First to Fight miniatures. This tankette is a tiny little tank with a two man crew. It was used at the start of World War 2 in the defence of Poland from the German invasion. This model is made by the Polish company First to Fight and is made of hard plastic. In this article I will review the parts of the model, assembly and painting. This model was provided to me free of charge by First to Fight miniatures for the purpose of this review. 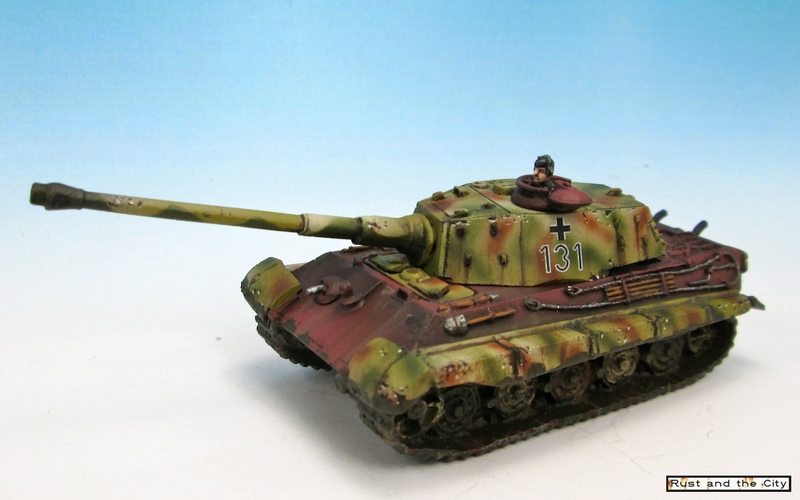 In this post I will show some pictures of a King Tiger I recently completed for a commission. The client requested the model be painted for a Desperate Measures list for Flames of War. He wanted a model that looked like it was cobbled together with some older parts and a new hull from the factory. I really enjoyed experimenting with some different techniques to paint this model. In March I attended Gottacon in Victoria and had to finish off a few last teams for my tournament list. Fortunately I had already painted most of it as I was frantically finishing the Kampfgruppe Peiper commission I was working on and finishing off some Mobelwagens for a friend to use in the tournament. I painted up two heavy mortar stands and a Firefly to complete my 1650 point tournament list. A few months ago someone on the WWPD forums asked me to post a tutorial on how I paint lights on my models. In this tutorial, I will show a step-by-step process for how I paint windows, lights, and canopies on my Flames of War models. This tutorial is pretty simple (it uses on 2-4 colours) and can be done relatively quickly. I've successfully used it on my Universal Carriers, Me262s, and a few other models. The Flames of War Kubelwagen shown here is from the Kampfgruppe Peiper commission I recently finished. 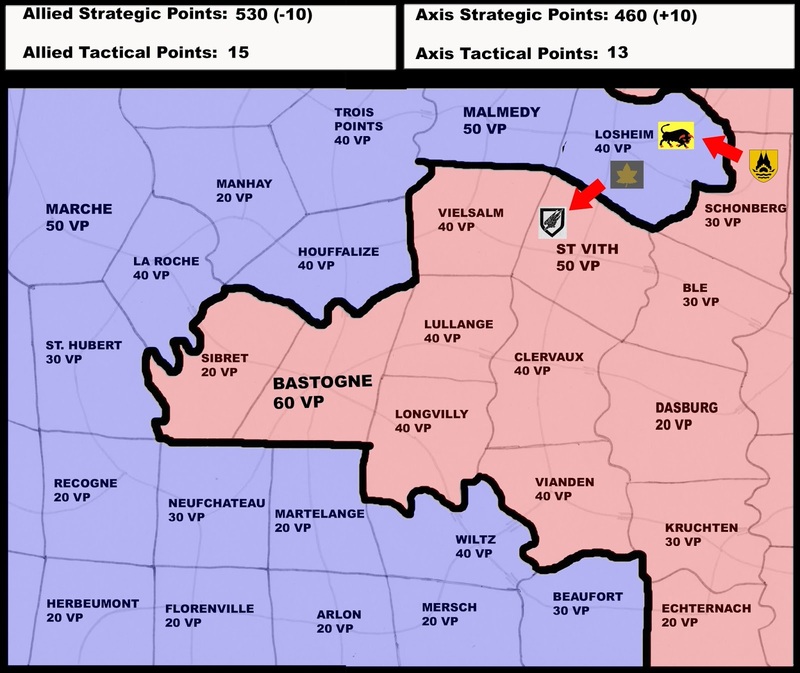 This weekend we completed two more games for our Battle of the Bulge campaign. Last week I explained how the campaign would work and showed the results of the first round of action. This week we had some more action in the Northern part of our map around Losheim and St. Vith. We had some close match-ups between the German Grenadiers and the 11th. 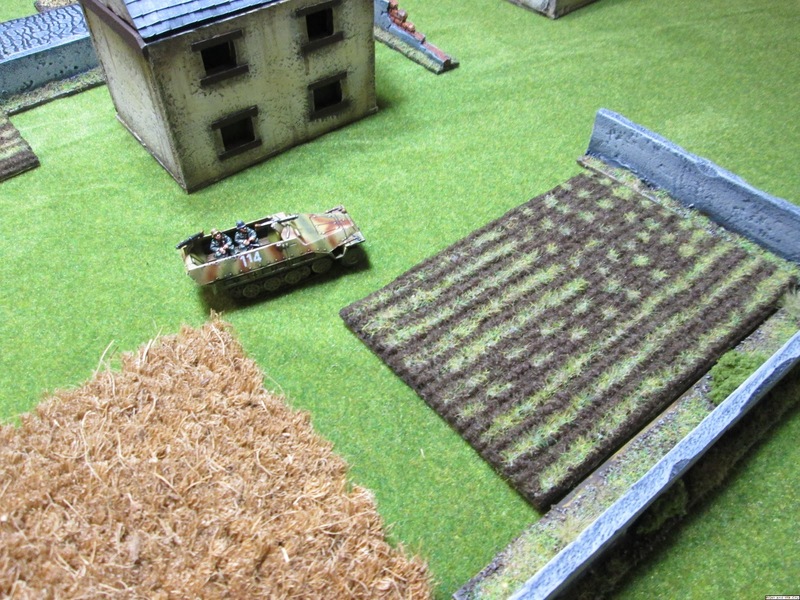 Armoured Division and another grudge match between the Fallschirjager and Canadian Infantry. Read on for pictures of the results of this week's action and to see the campaign standings so far. This week we've started a small Battle of the Bulge campaign for Flames of War with my new gaming group. In this post I will explain how the campaign works and show pictures and results from the first round of gaming. Our campaign will roughly follow an escalation format. 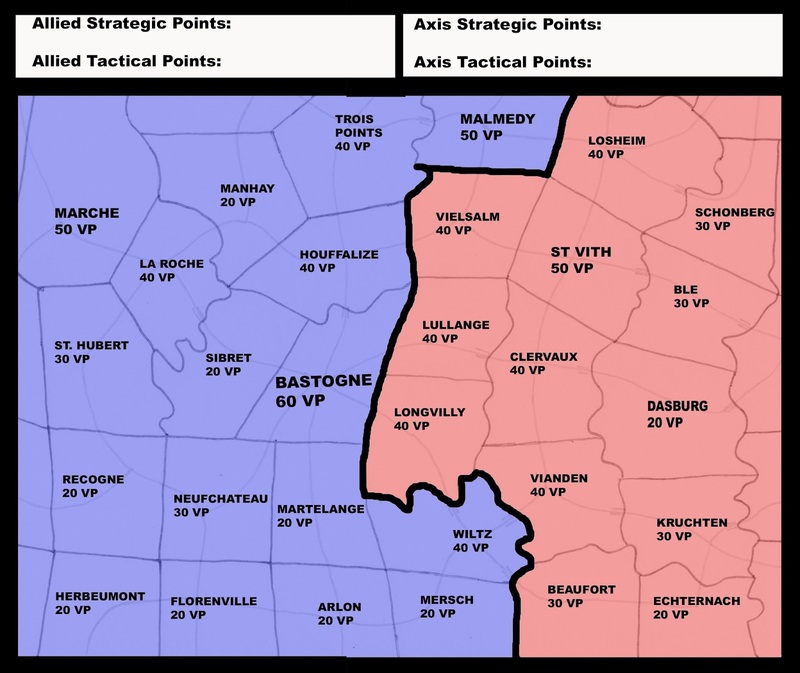 It is similar to Battlefront's Firestorm campaigns in that players play games to determine if territories with victory points are captured or not. This campaign is different in that there are no firestorm troops or supply. Each game is fought between evenly matched armies using standard Flames of War rules for determining attacker and defender. Read on for campaign mechanics and round 1 reports. In this blog post I will show you some pictures of some very simple tree lines I made from Woodland Scenics conifers. I will also explain how I made then and the reasons to include linear obstacles on your Flames of War boards. These King Tigers are the final models I painted for the Kampfgruppe Peiper commission. The models are Battlefront’s King Tigers with Fallschirjager tank riders. I painted the models with vertical stripes to match the rest of the company. The models were really fun to paint. They have lots of nice flat panels and large details. With this platoon, the Kampfgruppe Peiper commission is completely finished. This platoon was both the best and the worst platoon to paint as part of this Peiper commission. It was exciting to get an opportunity to paint some SS camouflage patterns. I experimented a bit with Oak Leaf and Pea Dot camouflage. The half-track models were surprisingly fun to paint. The downside is that I had to paint three half-tracks, four infantry stands, a kubelwagen and half-track crews just for a 90 point platoon of which only half of the models will be on the tabletop at a time. Overall though, I think they are quite a nice looking platoon. 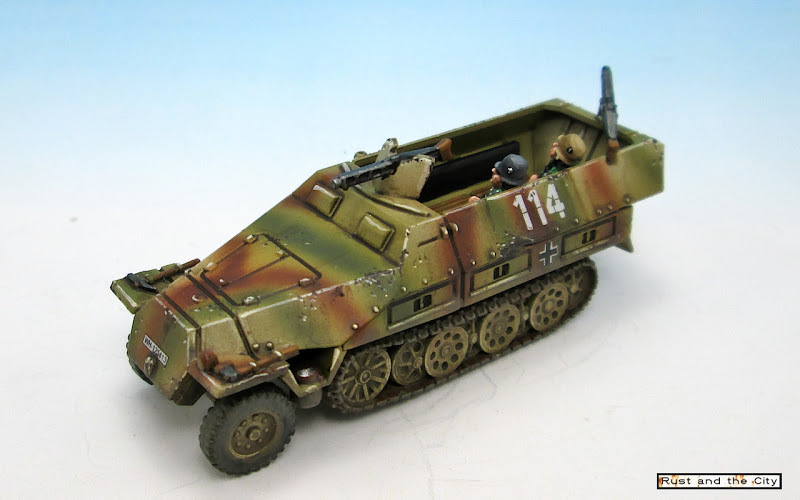 The Sd.Kfz 10/5 (2cm) is a Luftwaffe self-propelled anti-aircraft gun I painted as part of the Kampfgruppe Peiper commission I have been working on. The vehicle mounts an anti-aircraft gun on a half-track truck. These models were difficult to assemble but the crew were a lot of fun to paint. Read on for more pictures of the vehicles and some information on how I painted the uniforms. Panzer IVs are the backbone of most Flames of War panzer companies these days. Their low points cost, overall versatility, and ability to assault infantry make them a nice option for most panzer lists. The “German Sherman” comes in a variety of flavours. For the newer lists from the Battle of the Bulge to the end of the war the Panzer IV J is the panzer of choice. I painted these 9 Panzer IV Js from Battlefront as part of the Kampfgruppe Peiper (1st SS Panzer Division) commission I am working on. Read on for some more pictures of the finished models. 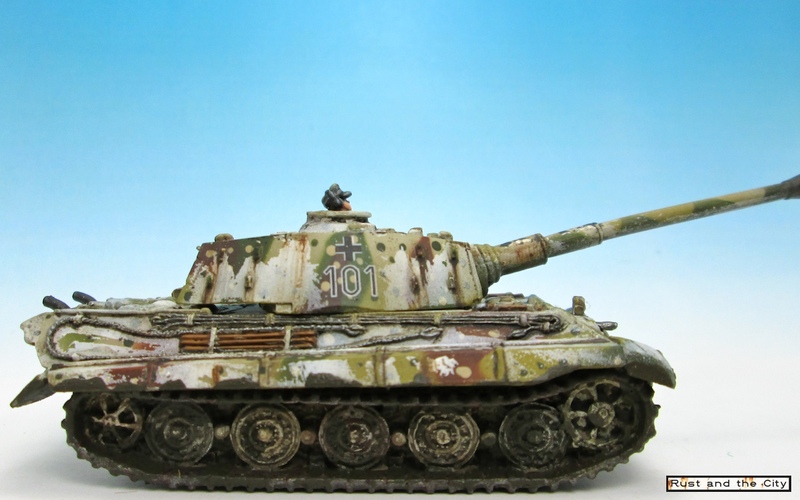 In this post I will showcase five Panther As in winter camouflage I have painted for Flames of War. The Panther models were quite a lot of fun to paint as some of the models had extra stowage, tracks, and details. The models were assembled from a bunch of broken Panthers I purchased used. In this post I will show a few pictures of Panthers and discuss the uses for them in games. 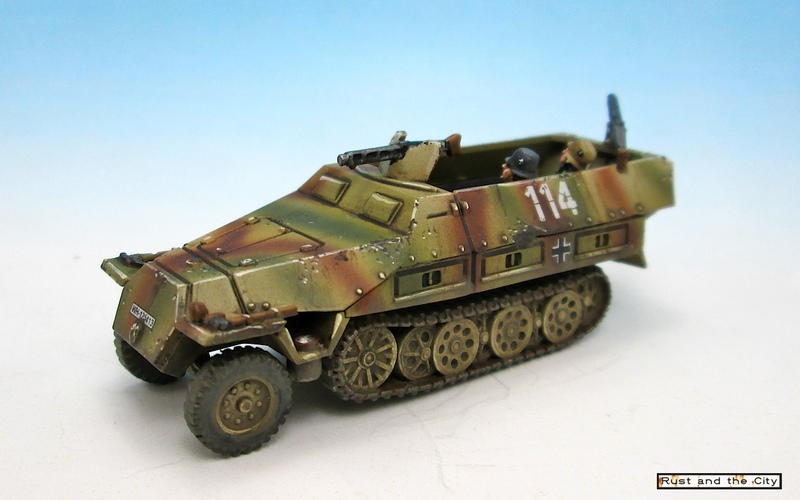 In this blog post I will show some pictures of a platoon of Sd.Kfz 234/1 and 234/2 Pumas I recently painted. I painted this platoon as the first platoon in a large Kampfgruppe Peiper commission I am working on. The client requested all of the models in the commission to be painted in the vertical striped, hard-edged camouflage pattern. So expect to see more Germans in this pattern soon! As part of the Kampfgruppe Peiper commission I am working on I painted a Me262. The Me262 was the world’s first jet fighter. More importantly, it has lots of really interesting camouflage patterns to paint. 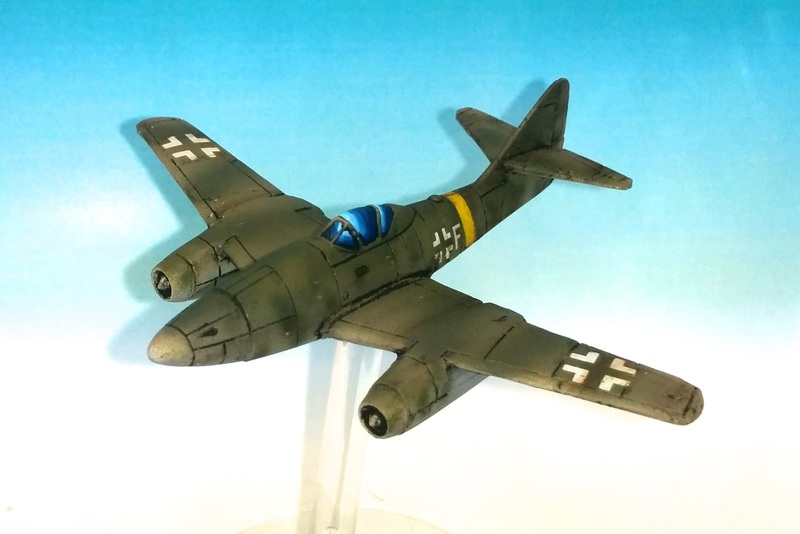 For this model I followed the tutorial on Me262 camouflage I posted last year. I’m glad I wrote the tutorial or I would have forgotten which colours to use to recreate the pattern! 2013 was a year of personal change for me. I started the year living in Vancouver, spent a few months working in another town, and then moved to Penticton, BC (in the Okanagan region of British Columbia, Canada about 400km away) in the fall. Throughout the year I have worked at six different jobs as things have been in flux and have settled into some new positions in my new town. On the hobby side of things, 2013 was a relatively focused year for me. I made lots of progress on Flames of War models and I feel like I really improved as a 15mm painter. In this post I will review last years goals and set some goals for the coming year.